Why "Gingers Have No Souls"
Is "Meme Magic" a Thing? Evangelicals will tell you that they don't use magick, but that's not true in any meaningful sense. They call it "prayer," but when it's done towards any specific defined objective it's the exact same thing. The only difference is that ceremonial magicians optimize ritual procedures to make them work better, while the "prayer" method seems to rely on simple visualization combined with strong emotions. That doesn't mean it can't work, though, and apparently a bunch of evangelicals are coming together to create a magical "prayer shield" around President-Elect Donald Trump at tomorrow's inauguration. Naturally, these folks want to bring America "back to God," presumably by driving all forms of religious expression but their own from the public square. 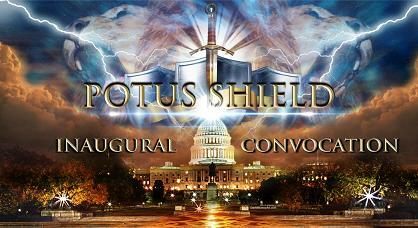 It is our time to storm heaven for a New America, revival in our land, and to bring our country back to God! We are the redeemed of the Lord who are coming to raise up a shield of faith and the sword of the Spirit. The Lord has summoned a prolific council of prelates and prophets to convene in Washington, D.C. one week prior to the inauguration of Donald Trump as the 45th President of the United States of America. These servants of God are especially gifted to discern the times and to prophesy the Word of The Lord, even so as we seek to prepare the way for transformation, reformation, and revival in our nation. We are called to gather in the nation’s capital and to raise up a shield of prayer and prophetic understanding, grounded in the firm foundation of the immutable Word of God, and inspired with fresh revelation by the Spirit of The Lord. These proven leaders are convening to release the Word of the Lord, and to lead this anointed assembly in powerful prayers, intercession, declarations and decrees over the White House, the Supreme Court, and Capitol Hill. I have seen many Trump supporters complaining about people who want "safe spaces," but really, that's exactly what the Poor Oppressed Christians are asking for when they pray like this. Apparently, their faith is so fragile that they find the mere existence of other beliefs horrific and traumatizing. It's rather hypocritical of them to argue that they, and they alone, are entitled to special protection from having their feelings hurt. Remember when I mentioned that the Moon can be used to conjure a sort of "magical cloak" that protects you from psychic influences? That's basically all a "prayer shield" is. So if there are any magicians on here interested in casting through the thing, you can call upon the angel of the Moon to take it down or punch a hole through it, and then cast whatever else you want once it's bypassed. You know, for entertainment purposes only - and because today just happens to be the day of Jupiter, which is perfect for political operations.